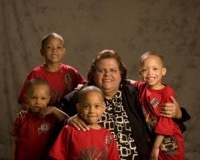 Linda has been a foster parent caring for older children for over seven years. She received a call in January of 2007 from Ramsey County to take in three sibling brothers who were 2, 3, and 4. Linda decided that she was up for the challenge! The oldest boy, Tydiante enrolled in Kindergarten in the fall and Javion and Kjon, the youngest of the boys, were referred to Lifetrack’s Families Together Therapeutic Preschool. At Families Together the boys thrived and made remarkable progress. They both made lots of friends and were often sought out by other classmates to play. They not only learned to have trusting relationships with their teachers but fell in love with their caregiver Linda. Last fall, Linda made the decision to adopt all three boys plus their younger brother William, who was originally sent to a different foster home. She recently purchased a new home to accommodate her family. She has truly enriched the lives of these children and the boys have done the same for her! Our community is at its best when we help each other thrive. It’s our connection to one another that makes success possible and gets us back on our feet after a setback. Yet, some of us do not have access to these important relationships – that’s where Lifetrack comes in.